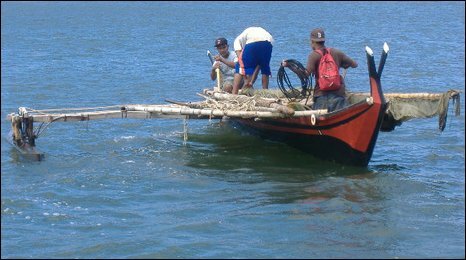 Sure to displease some here but the ancient long proved techniques for long distance boat voyages aren't gone quite yet.I'm sure I've posted in the past about both Micronesian and Polynesia efforts to preserve this precious knowledge it's great to see the knowledge being passed around still. The ancient skills of building ocean-going canoes and sailing them by star across great distances are being revived on the South Pacific island of Yap, as the BBC's Ben Lowings reports. 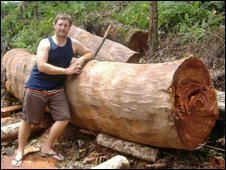 In the mangrove woods on the shores of Yap, part of Micronesia, canoe-builders are busy with adzes and saws. Groups of men - young and old - are standing on a carpet of wood shavings, fashioning local timber. As Chief Tharngwan looks on, the teams put together the vessels, ready for the first annual canoe festival of the Yap Traditional Navigation Society. No nails are used, nor blueprints or measuring tapes - just a leaf from a coconut palm. Chief Tharngwan places the leaf on the side of the hull and designates a cut with a sweep of his pencil. 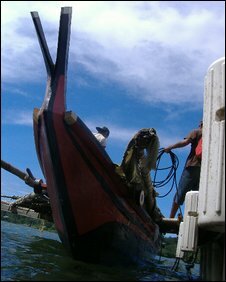 It is evidence that the Micronesian voyaging canoe is literally a design taken from nature. As the festival gets underway, in Colonia, the capital of Yap State, Yapese women will dance in grass skirts, with strands of red, yellow and green livery. An open-ocean voyage has been planned and smaller canoes will be raced on the smoother waters within the Yap reef. Watching from the shore, dozens of sailors and enthusiasts are expected from Yap's outer atolls, Guam and the neighbouring states of Micronesia. "Each island has a star above it... There is a star above this island. And there is a star above that place. And I steer between the two"
The drink of choice will be tuba - gallons of the liquid have been prepared for visitors and participants. It is a wine made from the fermented sap of the coconut palm. The celebration marks a revival of what was the world's first ocean-going technology - and the navigational methods used to steer the canoes across the vast Pacific. Master Navigator Ali Haleyalur teaches the art of celestial navigation. 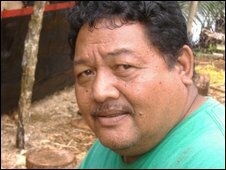 He is from the Yapese outer islands of Lamotrek and Satowal. He sails in the traditional manner - by the stars, winds and currents. He does not use maps, or star-charts. He points to his head. "It's all in here," he says. Marshall Islanders, Ali says, are the only Micronesians who make physical charts of any kind - and even these are only made of sticks and pebbles lashed together. "There can only be one master navigator on each island," he says. It will be many years before he chooses one of his students to take over his role. Even now, those students are keeping watch at night for him on the occasional inter-island trip. But he is the captain for now. He has sailed thousands of miles across the deep ocean. A whale surfaced under his canoe on a recent trip to the neighbouring nation of Palau, about 400km (250 miles) from Yap. The canoe was lifted out of the water on the whale's back. But his crew's prayers were eventually answered, he says, and the whale swam away. How do you sail on the deep ocean, without charts, lifejackets or radios? Mr Haleyalur laughs gently when I ask him if he keeps a GPS device as a backup. "No GPS," he smiles broadly. Then, in his soft-spoken manner, this big man lets me in on the basics of celestial navigation. It is a lesson, I imagine, in the same style as his quiet mutterings to his young initiates, on a starry night miles from land. "Even if you can't see the island on the water, you can see the island," he explains. The stars nearest the horizon do not wheel around the sky as do those higher up. "Each island has a star above it," Mr Haleyalur continues. "I sail through one place. There is a star above this island. And there is a star above that place. And I steer between the two." In essence, the navigator uses the stars as directional tools, to plot a course between islands - even if those islands are only a few kilometres wide, and hundreds of kilometres away from the boat. Ancient sailing and boatbuilding skills have been in decline for decades. But Mr Haleyalur is part of a new education programme now under way in Yap to try to reverse this trend. 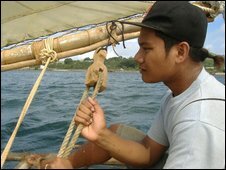 Yapese man sailing traditional canoe.Many young Yapese are not so interested in sailing traditional canoes. The Yapese boat builders are using the same skills as their forebears - who came here by boat. "We are constructing two types of canoe," Mr Haleyalur says. "One type from the outer islands - we are building paddling canoes from the outer islands, and voyaging canoes - very big ones." Islanders rely on marine outboard motors and imported fibreglass hulls when available. But Mr Haleyalur says sailing canoes are a realistic alternative transport for young islanders. "I believe we can use our canoes. We can move about between two places. In some places it's the only method of transportation. We don't want to lose this. We want to keep them alive." There have been problems getting young people interested. But it was Mr Haleyalur's students in their 20s - involved in the canoe school - who took me out in their 20-foot outrigger canoe. Underneath the tropical sun, we went out into the lagoon. The crew of three young men were surefooted, in tune with the movement of the boat. Their arms and legs cast strong shadows on the deck, almost seeming like part of the boat's rigging itself. "The world's first ocean-going technology is the reason people got going," he says. For Paul the canoe symbolises "the wanting to explore, to go to new places - the need to explore, to go to new places- for the survival of humanity." The ancestors of today's Micronesians set sail from the Philippines and landed on these remote shores, thousands of years ago. "That's what it's all about," Paul says. "People needed to find new places." One imagines that a prolonged period of clouds would be a major problem for such mariners but short of that it seems logical...given enough time to study the stars. Minimalist wrote: Good stuff, Sam. Point taken-however one facet of traditional navigation not mentioned in the article is an encyclopaedic knowledge of currents local and oceanic, this dovetails with cognition of Birds (both land and sea), Sea Mammals and Fish again both local and pelagic. Clouds of course form differently over land than sea, are different over various currents and of course presage changes in weather, the same breadth of knowledge that applies to other aspects of the traditional knowledge applies to cloud formations. I suppose if a storm comes up at sea and you are in a canoe you have bigger problems than wondering where you are, anyway. Isn’t it called the Pacific because it is peaceful? And are not the clouds caused buy the winds being directed upward when they hit land one of the things they look for? Still, remembering a star per island, is a lot of remembering. Balboa caught it on a good day. But doesn’t it being so big have something to do with it have less violent weather swings than the Atlantic? Water warms and cools much slower than land so you get smoother cycles? I remember a satellite photo I saw sometime this summer. It showed the entire North Pacific from Japan to California. You could see the GPS straight courses of the container ships all the way across. I think it depends on the season. Even as far North as the Tokyo to Seattle route you are in pretty warm weather. You are in the warm Japan Current, the Pacific version of the Gulf Current. The weather gets foggy at the coast (that is how you know you are getting near it) between San Francisco and Seattle, but it isn’t cold. But I think Hawaii is considered the north most site for this kind of navigation. And it is well south of LA. It is at the Mexico City latitude. I've been fishing on the North, East and South Pacific in small boats for decades, it's somewhat misnamed, if fact it's rough as guts. Since my information is second, even third, hand, I will bow to personal experience. My Pacific experience is limited to the beach at San Deigo. Sam Salmon wrote: Sure to displease some here but the ancient long proved techniques for long distance boat voyages aren't gone quite yet.I'm sure I've posted in the past about both Micronesian and Polynesia efforts to preserve this precious knowledge it's great to see the knowledge being passed around still. It is a headline word RS, not a scientific one. It will be a turn on for some readers and a turn off for others. kbs2244 wrote: [...] remembering a star per island, is a lot of remembering. It is if you sail between lots of islands. But I'm betting most sea/ocean trips were recurring ocassions. For trade. From your home island to a couple dozen other relatively near islands at most, and back. So you would only need to remember a couple dozen star/island combinations. Much the same as a river pilot.